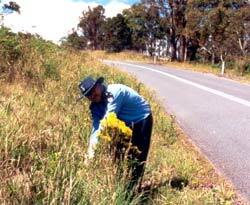 Tamar Valley Weed Strategy Annual Report Period for 2002. Outcome: TVWS has previously worked with the Tasmanian Fire Service to run this event. This year, the third of the annual events saw a record of 660km of roadside verges cleared of Ragwort. Community Volunteers who have previously attend the Ragwort Raid noted significant reductions in Ragwort Presence in the district with the exception of infestations on private lands. Cost: Total cost of the event including valuing the community volunteer labour inputs sees the Ragwort Raid achieving approximately $10,000 in costs. The greatest labour costs can be seen in in-kind support for labour from George Town Council, Tasmanian Fire Service, TVWS and DPIWE Weed Management staff for organisational and supervisory activities. This costing does not however incorporate the rationalisation of commercial herbicide application which was provided by DPIWE (exclusive of equipment costs) nor machinery costs provided by volunteers or the Tasmanian Fire Service Bushfire Volunteers or George Town Council.